When fumble-handed cook Mina Cucina drops the spaghetti pot, a new animal is born. As the Spaghetti Giraffe soon learns, he is not the only kitchen animal formed from Mina Cucina's culinary disasters. The Spaghetti Giraffe tells the delightful story of the Spaghetti Giraffe and his quirky friends in their quest to help Mina Cucina enter the Great Bonbon Confectionation – the biggest baking competition the valley’s ever seen. All she needs is a cake. A cake that doesn’t erupt, take flight or explode. 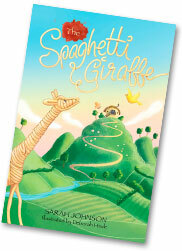 The Spaghetti Giraffe is the first book in a trilogy. The next book will be published in 2018. The story for The Spaghetti Giraffe came to me when I was on a plane. I was on my way to a children’s writers’ conference. I don’t often get to be by myself, and I don’t often sit still, so I guess the story saw its chance to arrive and took it. Actually, what arrived wasn’t the whole story. It was just the first four lines. But I could tell straight away that there was a bigger story behind them, and it wanted to be told! When I got to my hotel I wrote the lines down. When Mina Cucina slopped the gleaming pile of spaghetti onto the waiting plate, her hand slipped. As usual. Mina Cucina’s hands flailed like startled cats, as the pot somersaulted through the air. The spaghetti fell from it in a glittering arc and landed on the floor. I thought that might be it for a while, but the whole story came pretty soon after. I missed quite a lot of the conference, because I was in my room writing. There are some great characters in The Spaghetti Giraffe, and I had a lot of fun writing about their escapades. Thankfully they hung around, and now I’m working on the second book in the series. It will be published in 2018. Read the first two chapters of The Spaghetti Giraffe, in PDF format. Published by Flat Bed Press (2017). 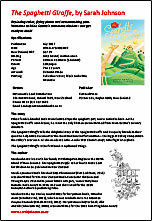 The Spaghetti Giraffe sales and trade information download the PDF.